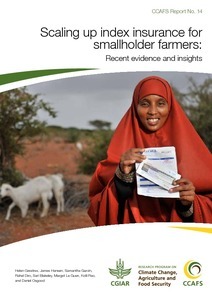 This report explores evidence and insights from five case studies that have made significant recent progress in addressing the challenge of insuring poor smallholder farmers and pastoralists in the developing world. In India, national index insurance programmes have reached over 30 million farmers through a mandatory link with agricultural credit and strong government support. In East Africa (Kenya, Rwanda and Tanzania), the Agriculture and Climate Risk Enterprise (ACRE) has recently scaled to reach nearly 200,000 farmers, bundling index insurance with agricultural credit and farm inputs. ACRE has built on strong partnerships with regional initiatives such as M-PESA mobile banking. In Ethiopia and Senegal, the R4 Rural Resilience Initiative has scaled unsubsidized index insurance to over 20,000 poor smallholder farmers who were previously considered uninsurable, using insurance as an integral part of a comprehensive risk management portfolio. With strong public and private sector support, the Mongolia Index-Based Livestock Insurance Project (IBLIP) insures more than 15,000 nomadic herders and links commercial insurance with a government disaster safety net. Finally, the Index-Based Livestock Insurance (IBLI) project in Kenya and Ethiopia demonstrates innovative approaches to insuring poor nomadic pastoralists in challenging circumstances. A few common features appear to have contributed to recent progress within these case studies: explicitly targeting obstacles to improving farmer income; integration of insurance with other development interventions; giving farmers a voice in the design of products; investing in local capacity; and investing in science-based index development. Evidence from these case studies can inform the ongoing debate about the viability of scaling up index-based insurance for vulnerable smallholder farmers in the developing world. The rapid progress observed in recent years suggests that index insurance has the potential to benefit smallholder farmers at a meaningful scale, and suggests the need to reassess arguments that lack of demand and practical implementation challenges prevent index-based insurance from being a useful tool to reduce rural poverty. Greatrex H, Hansen J, Garvin S, Diro R, Blakeley S, Le Guen M, Rao K, Osgood D. 2015. Scaling up index insurance for smallholder farmers: Recent evidence and insights. CCAFS Report No. 14. Copenhagen, Denmark: CGIAR Research Program on Climate Change, Agriculture and Food Security (CCAFS).